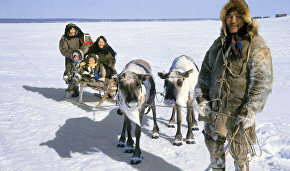 The traditional Chukchi cuisine is usually made of deer meat (venison) and fish from the cold rivers of the North. Their meals are high in calories to provide nourishment in the severe Nordic conditions. Here is a selection of the most amazing Chukchi recipes. This food is high in calories and vitamins and is normally consumed in spring. Deer blood is poured into its cleaned stomach together with boiled kidneys, liver, ears, fried hoofs (peeled) and lips with berries and sorrel. The stomach is then stitched together and put into ketyran (ice store) for the winter. This dish is made in summer in windy weather and stored until winter. Venison is dried in the sun on a special rack, in rainy weather — on the smoke from the stove in Yaranga (Chukchi hut). Venison is jerked, with only the top layer smoked while the inner part remains raw. The meat is served sliced, and its raw parts, if any, are cooked before serving. The top of the stalk and the leaves of knotweed are gathered before flowering, boiled, drained, dried and cooled. The herb is stored in a sealed dish in a cool place or in the freezing temperatures outside. It is eaten in winter, mixed with diced dried meat of a seal or a walrus, and added to all the traditional recipes. This is semi-digested moss extracted from a deer's stomach. It is used as an ingredient for various conserved foods and fresh meals. Here is a recipe of monyalo "a-la Chukotka": bring a large saucepan of water to a boil, add finely chopped meat, cook for 10 minutes and add fat. When the food is nearly ready, add blood and monyalo. Boil until the meat is cooked, season to taste. The Chukchi rarely use spices. Bone fat is the basis for this recipe. Deer bones are cut into small pieces and boiled for a long time. Fat rises to the top of the stock and is removed with a spoon. Palgyn is served with chopped herbs — fermented or boiled willow leaves and sorrel. Palgyn is used to make an unusual type of sausage. Venison is boiled and finely chopped, then mixed with palgyn, and put into a large intestine of a deer, then smoked over the Yaranga stove. Make non-fermented dough by mixing 1kg of flour with salted water and baking soda. Make round flatbreads 5-7 cm thick and 20-30 cm in diameter. Bury the flatbreads in hot sand under a fire and cover with sizzling coals. Then take the flatbreads out and place them on the side to cool off. The flatbreads are scraped with a knife, rinsed with water and dried again. Put fatty pieces of venison into boiling water. Once the meat begins to boil, add deer blood and boil until cooked. Grind well-frozen raw meat or fish into powder and enjoy.